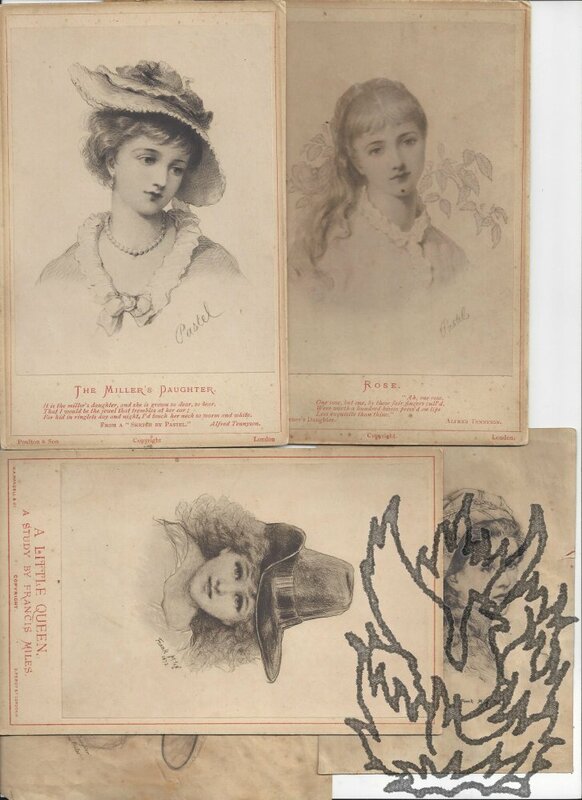 Fifteen Autograph Letters Signed from artist and poet Bowyer Nichols to his aunt Emily Mary Nichols, daughter-in-law of John Bowyer Nichols, with dozens of sketches and caricatures in letters and on 24 pieces of paper. The letters mostly from Southgate House, Winchester, Eagle House, Wimbledon, Winchester College; dating from between 1871 and 1875. All items in good condition, on lightly-aged paper. The letters total 49pp, 16mo and 8vo.. All are complete except the last, which lacks the last part. They are liberally adorned with sketches. Mostly addressed to 'My dear Aunty' and signed in a variety of ways, from 'J. Bowyer B. Nichols' to 'BBN'. The first letter, dated 4 December 1871, sets the tone, showing Bowyer Nichols to be a precocious and spirited twelve-year-old. It begins: 'Will you send me, if you can find it, that poem about Sally Porter and Charlie Church? I forgot to take it upstairs last evening, after I had written it out. Anonymous coloured print on sateen [cotton satin] entitled 'Three Christmas Roses'. Printed in pastel colours on the shiny side of a piece of white sateen. Landscape. Dimensions roughly 240 x 385 mm. Good, bright image on slighty grubby cloth, with fraying along the long edges (not affecting image). 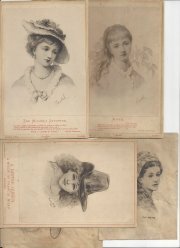 Depicts three head-and-shoulder portraits of pretty nineteenth-century ladies in hats (captioned 'Lady Pattie', 'Miss Betty' and Cousin Prue'), in Gainsborough style, hanging in frames on a wall of Georgian wallpaper. [ John Young, mezzotint engraver and keeper of the British Institution. ] Autograph Letter Signed ('Jno Young.') to Charles Westmacott, explaining why his 'picture of Cromwell' cannot be accepted for the present exhibition. British Institution, Pall Mall [ London ]. 12 May 1824. 1p., 4to. In good condition, on aged paper. He is desired to thank Westmacott 'for the offer of your picture of Cromwell for exhibition, and at the same time to inform you, that the arrangements, for the present season, are already completed'. He ends with the tact for which he was renowned, expressing the hope that he will have 'the pleasure of seeing you at the private [last word underlined] view on tuesday next'. The recipient is presumably C. M.
On letterhead of 24 Camden Square, N.W. [London] 29 October 1877. 1p., 12mo. In good condition, lightly-aged, with small piece of mount adhering at head. Accepting an invitation to dinner. [ From the stock of Henry Grey of Acton?] Collection of 114 genealogical and heraldic items, relating to British families, including manuscript and printed pedigrees, engraved coats of arms (including proofs) and armorial bookplates. [ Henry Grey, 1 Churchfield Road East, Acton, London? ] Ranging in date from the eighteenth century to the early twentieth century. 114 items, ranging in size and format. Many are extracted from eighteenth and nineteenth century English and French volumes. In fair condition, with signs of age and wear. Containing a few duplicates. Perhaps indicating provence is the presence, with two other items in a folder titled 'Hunt Family of Ireland', of a TLS to Grey from W. H. Hunt of Selkirk, 25 February 1923, asking him to supply genealogical 'extracts'. Of the present collection, the pedigrees, variously in manuscript, printed and engraved, are 24 in number. [ Daniel Maclise, Irish artist and illustrator. ] Autograph Note Signed ('Danl. Maclise') to Scottish painter Thomas Faed. On letterhead of the Athenaeum, London. No date. 1p., 12mo. In good condition, lightly aged. Laid down on leaf removed from album. Reads: 'My dear Faed | It will give me much pleasure to dine with you the day you name | Believe me | faithfully yours | Danl. Maclise'. [Leopold Lowenstam, English-based Dutch etcher.] Business letterbook, containing copies of several hundreds of his letters, over a twenty year period, to 72 individuals and institutions, including patrons and artists at home and abroad. Most earlier letters from 9 Titchfield Terrace, Regents Park [London]; most later letters from Woodcroft, Three Bridges [Sussex]. Dating from between 1877 and 1897. 380pp., 4to. Carbon copies on rectos of numbered leaves. Preceded by an eleven-leaf thumb index (not complete). In original brown leather half-binding, marbled boards and endpapers. Internally sound and tight, in heavily-worn binding lacking spine. At the heart of the correspondence are eight letters to the artist with whom Lowenstam is most of all associated, Sir Lawrence Alma Tadema. These date from the 1890s, and are all addressed to 'My dear Tadema'.